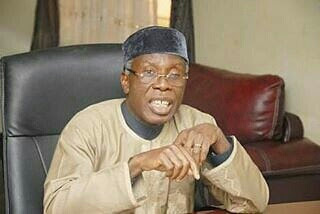 Chief Audu Ogbeh, has blamed rising cost of food items on corrupt practices of men of the Nigeria Police, Nigeria Army, and Nigeria Customs Service. .
Ogbeh told stunned members of the Senate Committee on Agriculture that the extortionist practices of the uniformed operatives especially at the numerous check points and ports was responsible for the acute hunger in the land. . The minister spoke at the 2017 budget defence of his ministry. He noted that despite having written formally to the Inspector General of Police, Ibrahim Idris, Comptroller General of Customs, Hameed Ali and other heads of security agencies against the unhealthy situation, the fraudulent practices remained unabated. .
Ogbeh said: "One of the factors responsible for the high cost of food items is the daily unbearable extortions men of the Nigeria Police, their counterpart in the Army and Customs Service visit on truck drivers conveying farm produce from the hinterland to urban centres under the guise of carrying out security checks. These truck drivers based on raw lamentations made to the Ministry in recent time, alleged that at every check points, they are always forced to part with reasonable amount of money by any group of the security agencies, which they said, made farmers to have no option than to factor cost of the extortion into prices of the food items."